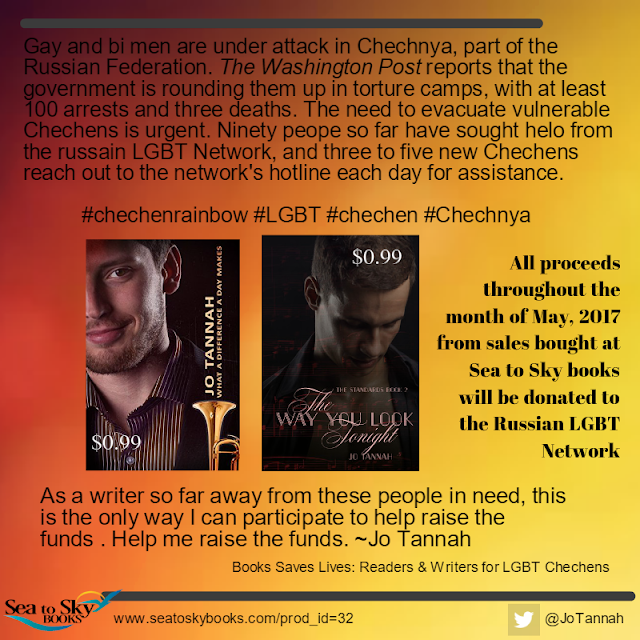 As a writer, I have joined together with other writers and artists to raise funds for the Russian LGBT Network, ILGA-Europe and Rainbow Railroad, which are helping LGBT Chechens escape to safety. As a writer so far away from these people in need, this is the only way I can help to raise the funds. Help me raise the funds by buying from Sea to Sky Books: What A Difference A Day Makes and The Way You Look Tonight of the Standards Series. Why did I choose Sea To Sky Books to make this all happen? It's because they remit the sales on a monthly basis direct to my PayPal account. This means, no waiting for three or more months from other third party vendors. This means I can send the money faster to the men in need. I need your help to make this happen.